Share the post "Ceratonia Siliqua Or Carob Tree: Grow A Chocolate In Your Garden"
Ceratonia siliqua, commonly known as the Carob tree, St John’s-bread, or Locust bean (not to be confused with the African locust bean) is an interesting plant widely cultivated for its edible pods, and as an ornamental tree in gardens. The ripe, dried pod is often ground to carob powder, which is used to replace cocoa powder. Carob bars, an alternative to chocolate bars, are often available in health-food stores. They contain fewer calories, are caffeine-free and non-addictive. Also they do not interfere with the body’s assimilation of calcium unlike cocoa and chocolate. Carob tree grows in rocky places near the sea shore, in regions where where winters are mild and wet and succeeded by a very long, dry season. Most carob trees are dioecious, some are hermaphrodite. The male trees do not produce fruit – a legume (also known less accurately as a pod), that can be elongated, compressed, straight, or curved, and thickened at the sutures. The pods take a full year to develop and ripen. The word carob comes from Middle French carobe (modern French caroube). It may have come from the Ancient Greek, where the seeds were used as units of weight (karat) or is alleged to be taken into Europe from Arabic kharrūb, “locust bean pod”. The word “carat”, a unit of mass for gemstones and a unit of purity for gold alloys, was possibly derived from the Greek word kerátion literally meaning a small horn, and refers to the carob seed as a unit of weight used by people in the Middle East. The system was eventually standardized, and one carat was fixed at 0.2 grams. In late Roman times, the pure gold coin known as the solidus weighed 24 carat seeds (about 4.5 grams). As a result, the carat also became a measure of purity for gold. Thus 24-carat gold means 100% pure, 12-carat gold means the alloy contains 50% gold, etc. Use of the carob plant dates back to Mesopotamian culture (modern day Iraq). 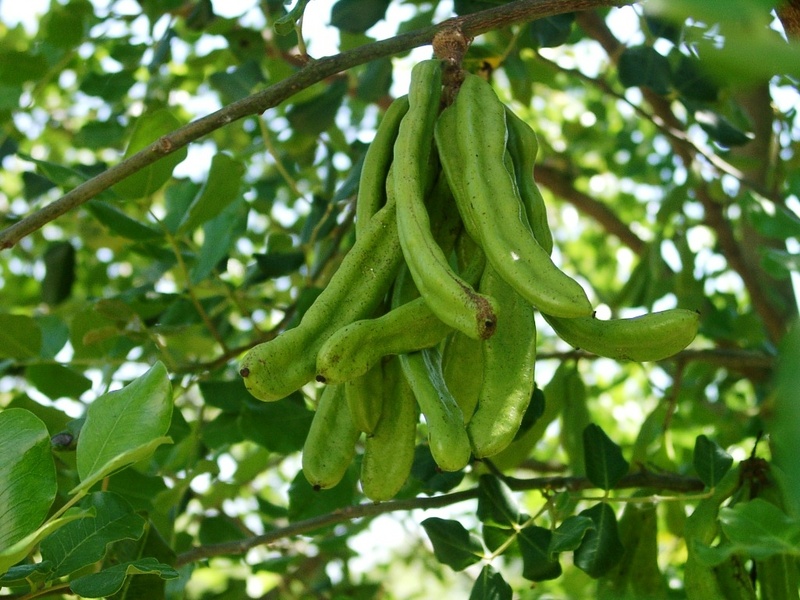 The carob pods were used to create juices, sweets, and were highly prized due to their many uses. The carob tree is mentioned frequently in texts dating back thousands of years, outlining its growth and cultivation in the Middle East and North Africa. Carob tree was also used for wood, carob seedpods were used as chocolate and coffee substitutes, in Sicily turned into alcohol, carob seed gum is used in foods, cosmetics, medicines, photographic film emulsions, adhesives, paints, inks, polishes and has numerous other uses. While chocolate contains levels of theobromine which are toxic to some mammals, carob contains significantly less caffeine and theobromine, so is used to make chocolate-flavored treats for dogs. During the Second World War, the people of Malta commonly ate dried carob pods and prickly pears as a supplement to rationed food. 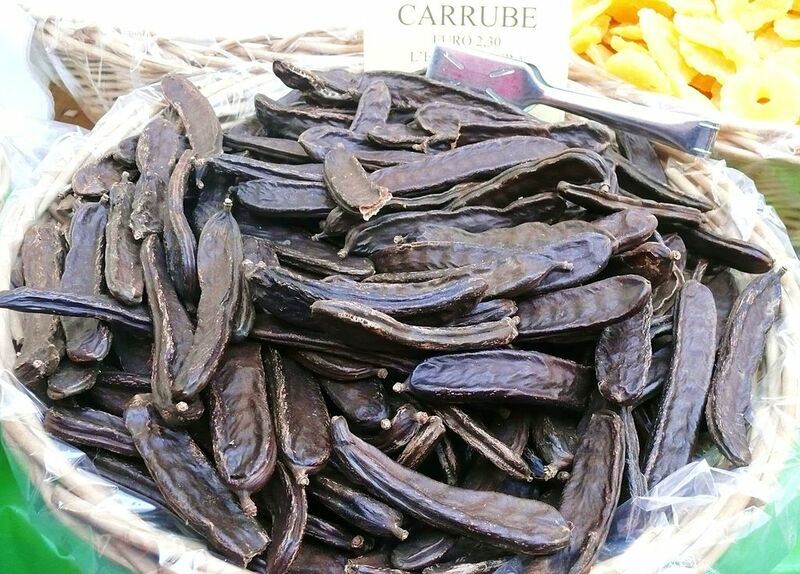 The carob has been used for human consumption and as animal feed in the Mediterranean countries for centuries. It is said that the pods of the carob tree sustained the biblical figure John the Baptist while he was praying in the desert. So, the carob is also commonly known as St. John’s bread. Native: Mediterranean region, including Southern Europe, Northern Africa, the larger Mediterranean islands, the Levant and Middle-East of Western Asia into Iran; and the Canary Islands and Macaronesia. Plant type: Tree or Shrub. Evergreen. Hardiness: USDA zone 9 – 11. Hardy to zone (UK) 8 and is frost tender. Soil: Sand, Medium Loam. Acid, Neutral, Alkaline. Can grow in nutritionally poor soil. Well-Drained. Moisture: Average Water. Drought Tolerant. Intolerant of waterlogging. Flower Color: Red. 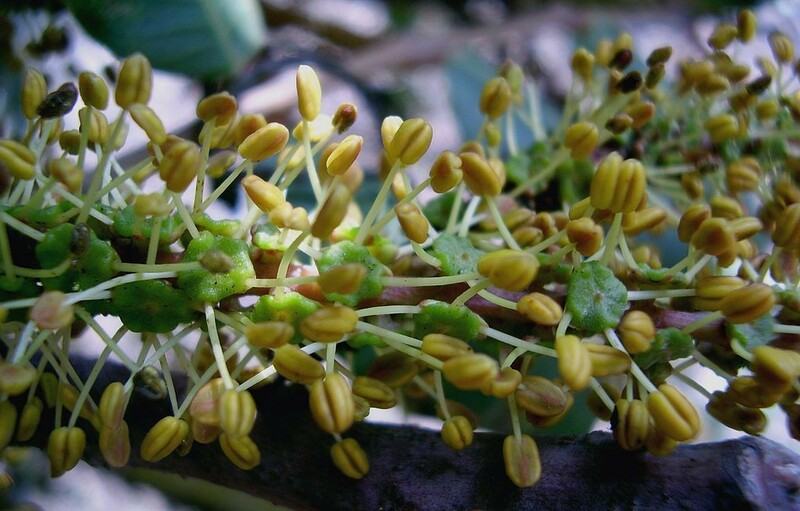 The flowers are small and numerous; they are pollinated by both wind and insects. Fragrant: Flowers. The flowers on the male trees have a very foul odor. • From seed; germinate in a damp paper towel and sow directly outdoors. • From seed; pre-soak for 24 hours in warm water prior to sowing. If the seed has not swollen then give it another soaking in warm water until it does swell up. Sow in a greenhouse in April. Germination should take place within 2 months. As soon as seedlings are large enough to handle, plant them into individual deep pots and grow them on in a greenhouse for at least their first winter. Plant them out into their permanent positions in late spring or early summer, after the last expected frosts. Give them some protection from the cold for their first few winters outdoors. Garden uses: Ornamental plant, Screening hedge, Xeriscape landscape design, Screening. Carob trees may also be helpful in degraded areas threatened by soil erosion and desertification. • Seedpods are filled with a saccharine pulp and can be eaten raw, or dried, roasted or ground into a powder. They are sweet but fibrous. The pulp, rich in sugars and protein, can be used as a chocolate substitute in cakes, or drinks. The pods contain about 55% sugars, 10% protein and 6% fat. Crushed pods may be used to make a beverage; compote, liqueur, and syrup are made from carob in Turkey, Malta, Portugal, Spain, and Sicily. In green non-ripe pods, condensed tannins cause a strong astringency taste in the mouth, making the pods unpalatable. This astringency decreases during ripening. • Seed is rich in protein (50%) and its flour can be used in human and animal nutrition. The roasted seed is a coffee substitute. The seed coat consists of cellulose, lignin, and tannin. • The production of locust bean gum (LBG), used in the food industry, is the economically most important use of carob seeds (and nowadays of the carob as a whole). LBG is used as a thickening agent, stabilizer, gelling agent, or as a substitute for gluten in low-calorie products. • Carob syrup is a traditional medicine for coughs and sore throat. • Carob syrup is also considered a natural source of calcium. It contains three times more calcium than milk. It is also rich in iron, phosphorus, and natural fibers (Due to its strong taste, it can be found mixed with orange or chocolate). • Carob tannins also have anti-diarrheic properties and that toasted carob powder is used to that effect in children. • The pulp in the seedpods of carob is very nutritious and, due to its high sugar content, sweet-tasting and mildly laxative. However, the pulp in the pods is also astringent and, used in a decoction, will treat diarrhoea and gently help to cleanse and also relieve irritation within the gut. • A flour made from the ripe seedpods is demulcent and emollient. It is used in the treatment of diarrhoea. The seed husks are astringent and purgative. The bark is strongly astringent. A decoction is used in the treatment of diarrhoea. • Carob pod meal is used as an energy-rich feed for livestock, particularly for ruminants, though its high tannin content may limit its use. • A flour made from the seedpods is used in the cosmetic industry to make face-packs. Tannin is obtained from the bark. Wood – hard, lustrous. Highly valued by turners, it is also used for marquetry and walking sticks. Self-Sowing: Yes. Deadhead if you do not want volunteer seedlings next season. Edible: Yes – Seed. Seedpod. Toxicity: Pollen may cause allergic reaction. • Not recommended for areas where roots can be a problem. • Great background for palms and other tropicals. • Typically you must have a male and female plant, if seed is required. Although some trees are hermaphrodite. • Move the plant to the greenhouse for winter if you are below USDA zone 9. • It is the dried seed-pods and not the seeds themselves which are ground for carob powder. • Carob tree prefers mild winters and hot dry summers. It has low cold tolerance and some 5000 to 6000 hours above 48°F (9°C) are necessary for pods to ripen. However, the carob tree can resist frost down to 21°F (-6°C). Do you grow Ceratonia Siliqua (Carob Tree) in your garden? What is your experience with this plant? Please share with other fellow gardeners in the comments below! Do you sell Ceratonia Siliqua (Carob Tree) seeds or have plants for sale? You can place your advertisement here. Contact us now!